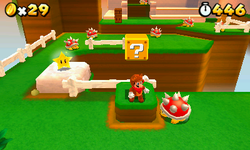 Special 1-1 is the first level of Special 1 in Super Mario 3D Land. The level is based upon World 2-1. It also introduces the Statue Leaf and the Poison Mushroom. The level contains many Spinies, Prongos and three Super Stars. At the start of the level, there is a Statue Leaf on a Stump. After collecting the Statue Leaf, the player can Ground Pound the Stump for a coin. Behind the Stump is an area containing many Spinies and two ? Blocks. One of the blocks contains multiple coins, while the other contains a Poison Mushroom. To the left of the blocks is a Super Star which is located on a rock; if the player collects this they can easily destroy the surrounding Spinies. The player must then jump up the steps which has another Super Star located near them; the player can use this to destroy the Prongos afterward. The player must then cross three trampoline platforms and then after walking across a platform, they must use more trampoline platforms to reach the top of the castle, where the player can grab the final Super Star and use it to destroy the surrounding Prongos. To reach the top of the Goal Pole, the player needs to use the ascending platform. Star Medal 1: Located in the exact same spot Toad put it in World 2-1, but above a Coin Block. Star Medal 2: Located on the trampoline platforms that lead up to the flagpole. Star Medal 3: Located in the exact same spot Toad was in World 2-1. This page was last edited on April 5, 2019, at 18:17.